In 1994, Hired Hands Homecare was humbly small, not yet a year old. In celebrating the Holidays, we welcomed our Employees and Client to join us for a small Open House in our office. At the end of the day, one of our most amazing Caregivers presented a most simple and wonderful gift. Every year we light the candle before we turn the lights out in the office, and go celebrate with friends and family. 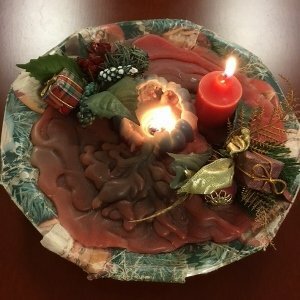 A simple paper plate, wrapped in Christmas paper, with candles and ornaments. It means so much, and it has shined brightly for so long. Twenty three years later, we’re honored to light the candle and celebrate ALL those that we have the honor to work with, and for! Not a caregiver was stirring, so quiet, like sand. Staffed and completed with certainty and flair. Knowing they had everything licked! While visions of caregivers danced in their heads. Erick networking which he does really well! Liz being his sidekick and ringing the bells. Kirsten visiting clients through many the miles. Diana working diligently, the best bookkeeper we’ve had. If only caregivers would do as they’re told!!! We all sprang from our desks to see just what was the matter. We knew in a moment it’s the Home Care St. Nick! Thank you, thank you, for all that you do!